Have You Thanked Your Readers Lately? With the holiday season in full swing, it’s important to reconnect with family members, enjoy good food, and most importantly, give thanks. On the business end, it’s essential to reflect on ways to thank your readers, customers, and niche followers. Giving thanks is a win-win for you and your audience because both sides feel the positive energy through the message. If you’re looking for ideas to accomplish this, we have a few to consider. It’s the perfect time to show others how much they mean to you. Seize the opportunity! 1. Send a Thank You Email: This is perhaps the most common form of thanks to reach a wide audience. Send a thank you email to those who recently purchased a product, commented on an article, or interacted with your business in a positive way. Write a personalized message for your most active or engaged customers. 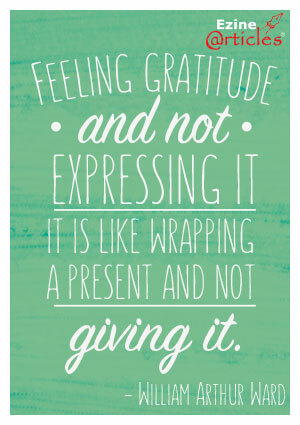 It may seem old-fashioned, but it’s still an effective, genuine method of expressing your gratitude. You may be surprised on the feedback you receive from something as simple as this. 2. Shoot a Video: Videos are a crucial aspect in promoting your brand and vision. They are a potent force of influence due to their personal nature. Thank your readers by giving a behind-the-scenes look at an aspect of your business, or share a personal experience that means a lot to you. These videos don’t have to be long; keep it short and sweet! 3. Ask for Feedback: Many companies rely heavily on consumer feedback. Asking for suggestions and actually following through is a great way to give back to your audience. When you’re due for some changes in your business, reward customers by choosing their best ideas, and praising them publicly or personally for their brilliant contributions. They will appreciate your dedication to take their feedback to heart. 4. Offer a Freebie or Special Deal: Corporate gifts are always popular around the holidays; however, they can also be very expensive. If you don’t have the budget to give away free promotional items, consider running a special. Slash prices on existing items or plan a new promotion around the holidays to give back to your customers. “Special deals” can be focused on recurring customers where only a select amount will be thanked in this way, which creates a feeling of exclusivity. 5. Interact with Them: If you have a large following, it can be difficult to respond to all comments and feedback. Don’t slack off in this area. Make the time to comment back to those who gave you a line of appreciation or inspiration. There can be some real gems in the comment sections of your articles, blog, social media pages or app reviews, don’t let them go unrecognized. They’re your biggest fans; let them know you’re listening! 6. Put Them in the Spotlight: Dedicate a portion of your website to feature your best followers or customers. You can point out their exceptional talents, thank them for their efforts, and also showcase their business or product. When you reach out to them to get their permission, you can also ask a few questions about themselves and their business. Let them know they deserve recognition for whatever it may be that you find to be exceptional. 7. Provide Quality Content: We couldn’t end this list without pointing out the most obvious, and sometimes neglected way of thanking your readers… new content! Reusing old material is not going to win over your audience. You need to work for their praise and trust, and original content is a sure way of making an impact. Strategically plan new articles and promotions, and keep things interesting for your readers. There you have it, 7 ways to give thanks as an article writer! If you’re pressed for time, focus on the most accessible forms of thanks from the list above. If you’re pondering these ideas, but are unsure if your readers have really done anything for you lately, this post may be up your alley. Do you have any great ways to thank your audience? Please share! As always, THANK YOU for reading! What a lovely and positive message, Courtney. Thank you. Great post, it is the season to be thankful, I am thankful to my customers, my prospects, and internet friends, I need to tell them. I have over 3700 friends on facebook this could be a challenge. But Thank You for the idea. Interesting and topical issue. Media like TV and Newspaper can serve double purpose of Saying-Thanks and Advertisment. Thank for this informational massages. A good list of ways to give – but one more point. As we’re in business, it’s good to ‘blow our own trumpets’. So we should (with appropriate humility) tell our readers and customers about the ways that we are giving to them, as well as just doing it. As a Brit, I’m naturally reticent to tell others how good I’m being to them, but it’s sound business practice to do so if it helps them to know about it and attracts them enough that they’ll give us business. Listing them as benefits to customers is fine, but probably the best way is to advertise customer comments and recommendations which highlight what we’ve done for them. There’s no better advert than a personal recommendation! We get those recommendations mainly through thorough follow-up emails after a sale, whether online or in person. 1) On receiving an order we confirm this with a personal, not only an automated response. 2) On despatch, we send detailed help with the confirmation, addressing key points on the sales web page. 3) A couple of days after receipt of the goods, we send a short reminder of key points and ask if we can help further. 4) Two months later, we send an email asking for feedback, reminding them of the 90-day refund policy and offering help in case of problems. 5) Only occasionally do we send a promotional email, and then only say, near Christmas, or when new products appear. We find that this ‘help you, not pester you’ approach is much more appreciated. Further business comes much more from personal recommendation than by sales pitches, as testified by the worldwide pattern of sales: new customers live suspiciously near to previous customers! I have read this awesome article and would like to say thank you so much for providing such a useful article. Good Job. Thank you for posting this very informative article. I’m all for freebies. I know it makes my readers happy, but it makes me happy as well. For instance, not long ago I received an email from a huge company that I’m an affiliate for, and they gave all of their affiliates free access to a $400 product that they are launching. I have to tell you, I feel very loyal to them right now and want to not only promote their products more, but buy them as well. It is a gesture that speaks volumes. It is really important that you have to give thank you when your customers are under-touch and you feel free to connect with them though various ways. Every thank-you you give should be unique, so there’s no real template to follow, but there are guidelines you can keep in mind to make sure your message hits the mark. If you want to know how to write a great thank-you message to show appreciation to your customers, learn more. It’s almost always helpful to present the company name, logo or other branding information in the customer thank you document. Again, this re-emphasizes visibility for the business. It helps to grow your branding and reputation. Include your contact information in the “Thanks Giving Message” you always want your contact information in an easy-to-find area on the Message. The purpose of your Message isn’t necessarily to sell, but if your customers are inspired to reach out to you because of the message, you want them to be able to find you. Note the contact buttons on the Message below. Thanks for sharing this great article to give thanks giving as a article writers, however I focused on customer based message. Thank you for reading my articles and Ezine! Merry Christmas and a blessed 2015 to all! My hugs! Years ago I read a book which I enjoyed so I took the time out to send a letter to the author. This was pre internet and the wonders of digital communication. He replied with a standard postcard but written on it were extra words to the effect that as an author he can see the volume sold but it is only through letters such as mine coming in to him that he could get a feel for how much readers were enjoying his work or not as thee case may be. These are great tips! Thanks for sharing! These are fantastic tips. Thank you. As I regular writer of articles and Kindle books, I found your article to be very interesting and useful. Thanks Alan for appreciation of my ariticles. I will love to have future comments on my articles. Courtney dear, thanks for your great article. It is a beneficial and informational detail. I thank all my readers for reading and liking and articles. I will be waiting for their feedback. Thanks again. Thanks for sharing. Quite interesting and positive tips. Worth following them. Another great article, It illustrates a principle that I learnt as a member of the Institute for Marketing Management (IMM) “Complement the action you want repeated” and Zig Ziglar taught that the more you thanks you give, the more thing you will attract to be thankful for. I HIGHLY recommend every writer and author both read and implement the information in this great article! It makes a huge difference for everyone. Thank you, Chris for your outstanding contributions to our world.